Added focus on the unmet behavioral health needs of returning veterans. Ronkonkoma, NY - August 5, 2014 - Three Suffolk-based non-profits dedicated to helping people with mental illness officially announced their merger and will now operate under the new name, Association for Mental Health and Wellness (MHAW). The announcement was made at a July 23, 2014 press conference held on the front lawn of a supported housing facility run by Clubhouse of Suffolk, Inc., the lead partner in this new endeavor. The two other organizations are Suffolk County United Veterans (SCUV) and the Mental Health Association in Suffolk, Inc. (MHASC). The announcement culminates a two-year transition where all three organizations have been working under one administrative umbrella. “As the field of healthcare evolves with public policy changes and promising new technologies, the Association for Mental Health and Wellness is positioned to help ensure that mental health is considered as important to one’s overall wellness as physical health for children, veterans, and adults of all ages,” commented Michael Stoltz, LCSW. Stoltz was Executive Director of Clubhouse since its inception in 1990 and will now serve in that top leadership post for the Association for Mental Health and Wellness. For nearly a quarter-century, Clubhouse of Suffolk, Inc. provided psychiatric rehabilitation and vocational support services to some 1,200 people each year. A key part of this new partnership will be added program capacity to address the many unmet behavioral health and addiction needs of homeless veterans, especially those recently returning from multiple deployments in the Middle East. These veterans face new challenges stemming from the unique experiences of today’s battlefield. “We have learned from our veterans that there is hope, health, and recovery after mental health setbacks. This new Association will help to ensure that wellness beyond adversity is attainable for those who have proudly served our country,” said Thomas Ronayne, Director of the Suffolk County Veterans Service Agency. “I look forward to a continued strong alliance between Suffolk County and our community partners in supporting veterans in their time of need, whenever and wherever that may be.” Founded in 1989 by Vietnam Veteran John Lynch, SCUV will continue as a program of the Association for Mental Health and Wellness. SCUV provides emergency housing for some 200 veterans annually as well as support services for more than 1,300 veterans and their families each year. Aside from operational efficiencies that will be realized by the economies of scale, equally important will be promoting a better understanding of issues regarding mental health and working to eradicate the stigma associated with it. During National Mental Illness Awareness Week, October 5 through 11 this year, the Association for Mental Health and Wellness will be expanding activities on Long Island to include advocacy and education programs in schools, with lawmakers, and within the general community. Along with the new name, the Association for Mental Health and Wellness has launched a website at MHAW.org. On Facebook, the organization can be found on Facebook and YouTube. On Twitter and Instagram go to @MHAWSuffolk. 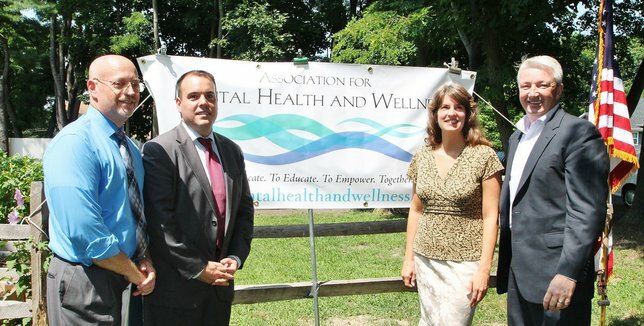 Pictured in front of the newly unveiled banner for the Association for Mental Health and Wellness are, from left, Michael Stoltz, LCSW, Executive Director, Association for Mental Health and Wellness; Hon. Daniel Panico, Brookhaven Town Councilman and Deputy Supervisor; Dr. Kristie Golden, Ph.D., Associate Director of Operations at Stony Brook School of Medicine, Department of Psychiatry, and; New York State Senator Philip Boyle. Subject: LongIsland.com - Your Name sent you Article details of "Merger of Three Organizations to Bolster Mental Health Services and Advocacy in Suffolk"